Cassini tracked a variety of evolving features in Saturn's rings throughout its mission. Left: small-scale dynamical features known as 'propellers' are disturbances in the rings created by moonlets. The propeller seen here in Saturn's A ring was imaged on 21 February 2017 (image scale is 207 m/pixel). The width of the gap is estimated to be about 2 km, with a tiny central moonlet thought to be driving the feature. Original image. 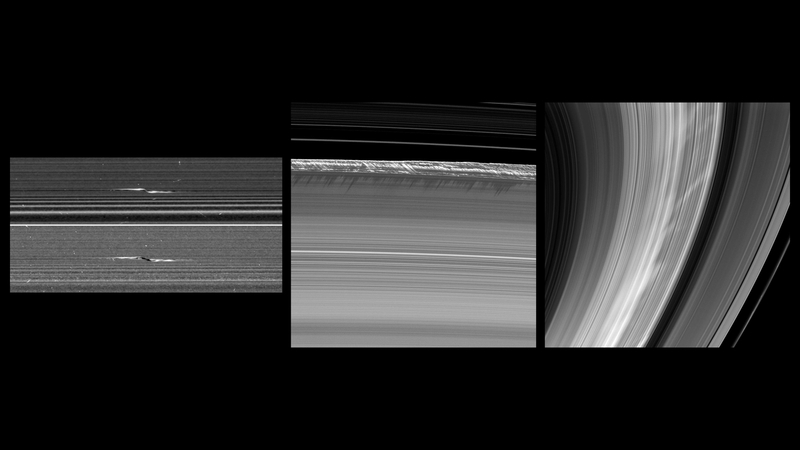 Middle: the exquisite detail of vertical structures in the rings was revealed at equinox. They are driven by gravitational perturbations of nearby moons, with the peaks rising to about 2.5 km above the plane of the rings. The image shows a 1200 km long section imaged on 26 July 2009, and the image scale is 2 km/pixel. Original image. Left: 'spokes', features that rotate along with the rings like the spokes in a wheel, were seen to appear and disappear with the seasons. This image shows the radial markings as the planet approached equinox in August 2009 (image scale is 30 km/pixel). Original image.